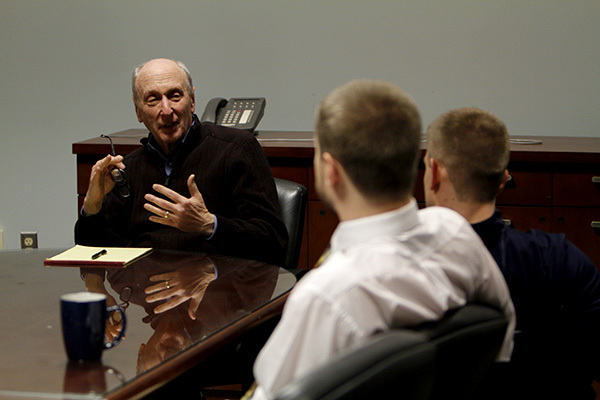 Lance Hoffman, the director of GW’s Cyber Security Policy and Research Institute, teaches students participating in the CyberCorps program, which is funded by grants from the National Science Foundation and the Department of Homeland Security. Updated: Jan. 31, 2015 at 1:05 p.m.
Eric Armbrust may only be a sophomore, but he said he feels like he’s already a graduate student. The undergraduate computer science major is working alongside some of the big names in hacking and privacy, and he’s not alone. At the Cyber Security Policy and Research Institute, the research and events held by faculty and students from all 10 of GW’s schools is attracting attention from federal officials and news media. And even though Armbrust is one of the institute’s youngest students, he’s able to work at the same level as master’s and doctoral students, and teach other students his age about cyber security issues. He and political science Ph.D. student Trey Herr were able to connect through the institute, and they are now working on a project to find ways to determine where a cyber attack comes from – research that they say is urgent in light of recent attacks. The institute’s director, Lance Hoffman, said after events like the hack of Sony Pictures Entertainment last month, he expects his center will only grow. “What’s more interesting is what’s going to happen in the future,” he said, adding that there have been no talk about making cuts to the federal budget and other cyber security budgets. Hoffman said the institute is supported by the School of Engineering and Applied Science, and grants from the National Science Foundation and GW’s Office of the Vice President for Research. The institute, which has moved into the former office of the School of Engineering and Applied Science dean in Tompkins Hall over the past few weeks, hosts CyberCorps, a program including more than a dozen students who receive full scholarships for the year and are placed in organizations like the National Security Agency and FBI. Hoffman said applicants to the program have backgrounds in political science, economics, computer science and other areas – a sign that the topic isn’t limited to only those with experience in technology. He argued that even though it’s important for the students to understand computer science, they don’t have to be computer scientists to succeed. Stipends for those students will increase next year: Graduate students will receive $32,000 a year, and undergraduates will receive $20,000. The institute’s influence has extended as far as the GW Law School, where research professor Orin Kerr specializes in surveillance law and cyber security law. A member of the institute’s advisory board, he helps determine the direction of the institute and participates in events like panels and debates. The Hatchet incorrectly reported Trey Herr’s last name as Hoffman. The Hatchet also incorrectly reported that Lance Hoffman said GW officials were not talking about cutting the cyber security institute’s budget. He was actually referring to the federal budget. The Hatchet incorrectly reported that the CyberCorps program includes about six students. The program funds about six new students a year, but has between 12 and 15 students at a time. We regret these errors.